Manufacturer of burns treatments baths | Burns treatment bath. We believe that patients with burn wounds or severe scarring deserve excellent care. The EWAC Medical burns treatment baths are designed for the specific needs in the field of burns treatment and chronic skin problems. They have been developed in co-operation with leading specialists in the field of burn treatment. 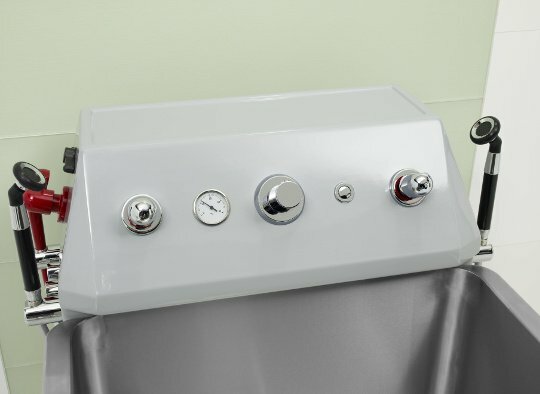 The baths are perfectly designed and meet the highest standards for hygiene, ergonomics and durability. The EWAC burn treatment baths are designed in close cooperation with the users of the product resulting in a product that exactly matches the needs of practitioner, the nursing personnel and the patient. The baths are available in a stationary as well as two height adjustable versions. Patients with burn wounds or other chronic skin problems needs a sterile environment to remobilise joints and skin. Water reduces pain and makes ligaments and scarred skin more flexible. Our Burns treatment bath offers a safe environment to treat burn wounds and severe scarring. EWAC Medical’s burns treatment baths have been designed to meet the specific demands in the area of burns treatment and chronic skin problems. They have been developed in close co-operation with leading specialists in the field of burns treatment. 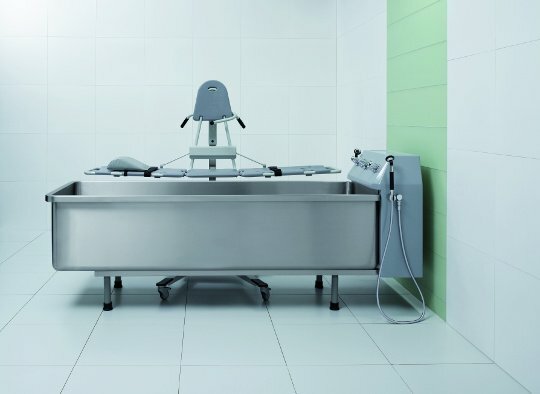 Burns treatment baths are available in two different versions: height adjustable and stationary. The height adjustable version can be fitted with a bath with standard length or an elongated version. The advantage is that taller patients can be completely submerged for treatment of the ears and facial area’s. 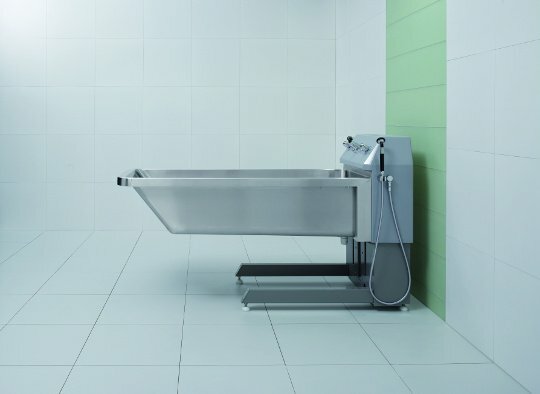 The EWAC Medical Burns treatment baths are made out of durable stainless steel, which is easily disinfected and cleaned. This ensures maximum hygiene. They can be equipped with automatic filling, automatic disinfection, anti scalding as well as low frequency ultrasound. EWAC Medical does not only supply burn treatment baths, but also makes an active contribution to the acquisition and distribution of knowledge about hydrotherapy and burn treatment. On this page you will find more in-depth information on all aspects of the use of burn treatment baths in rehabilitation. The EWAC Medical burn treatment baths are designed according to the specific needs in the field of burns treatment and chronic skin problems. They have been developed in co-operation with leading specialists in the field of burn treatment. The bath tubs are available in different versions, height adjustable and stationary. 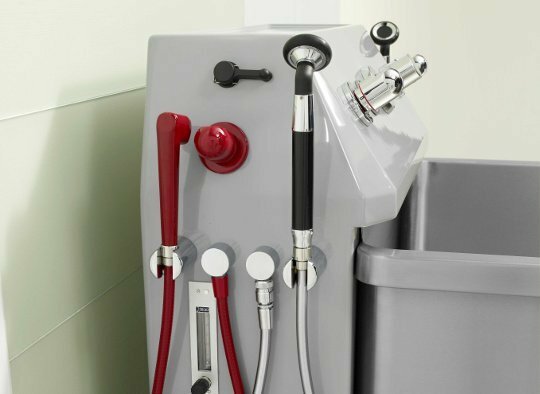 The height adjustable version can be equipped with a standard length bath tub or a version for tall patients. The advantage of the elongated version is that tall patients can be fully submerged to facilitate skin treatment on ears and face. 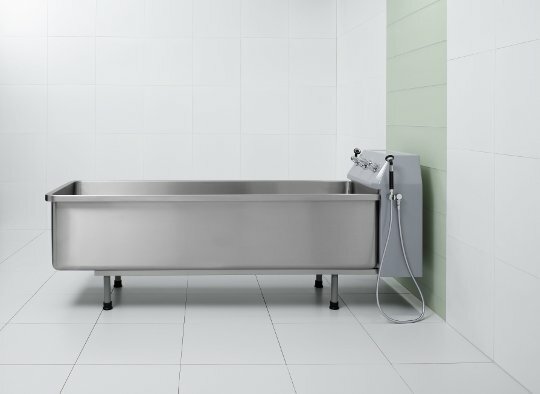 All burns treatment baths are made out of first class stainless steel AISI 316 with a perfect finish, complying with the highest standards of hygiene and long lasting durability.